Light the ground, not the sky! That's what Seagull Lighting says about Dark Sky fixtures. Today I thought I'd do a little education piece because I'm guessing a lot of people have never heard of the Dark Sky movement, or how we in the lighting world can help. There are 2 main schools of thought behind this movement: to cut down on "light pollution" so we can see the stars, and to save the turtles. Yes, turtles! As Progress Lighting states in their "Green" catalog, "There are often many artificial lights near highly popluated beaches that can deter females from nesting and disorient hatchling turtles on the way to their ocean home. 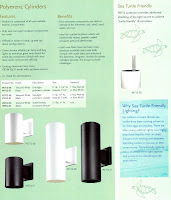 Turtle-friendly lighting helps to shield these light sources and preserve our dwindling turtle populations." Lots of our manufacturers offer at least a few options for Dark Sky fixtures, so if you're interested in seeing more, please let us know!